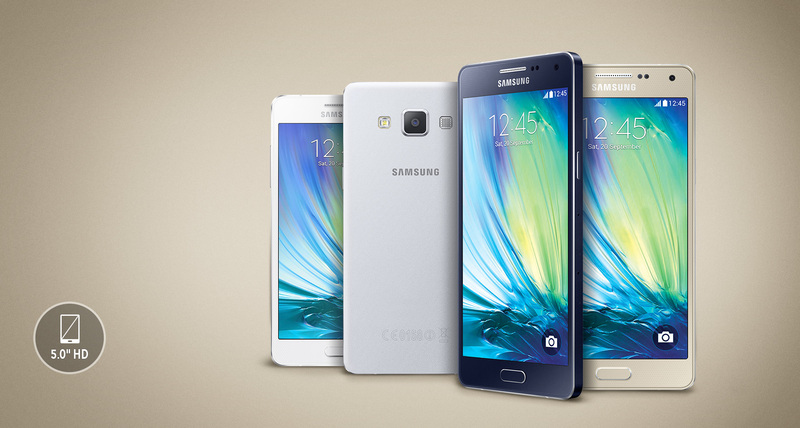 The Samsung Galaxy A5 features some amazing specs & features that targets the youth. It comes in variety of colors in a metal structure. In terms of physical specs, Samsung A5 comes in 139.3 x 69.7 x 6.7mm, with the weight of 123 grams. The Samsung Galaxy A5 operates on 1.2 GHz quad-core processor and 2GB of RAM that is enough memory for high speed working. We are providing here the complete details about Samsung Galaxy A5 Price in Pakistan Specification Features Pictures. Samsung Galaxy A5 are SIM, Super AMOLED capacitive touch screen display, 16GB internal memory expandable up to 64GB, 2GB RAM, 13MP main camera, 5MP front camera Android kitkat OS, 1.2GHz quad-core CPU and Li-Ion 2300mAh battery. Samsung Galaxy A5 is available in pearl white, black, silver, soft pink, light blue and gold colors. Whats New? Samsung Galaxy A5 – The Thinnest Luxury Ever! Samsung presents Galaxy A5 with no plastic at all and takes on the new Aluminium Metal frame instead. Samsung Galaxy A5 is designed for the class who takes social networking much more seriously and like to take their own selfies. Like its brother Samsung Galaxy A3, the specifications does not ring any bells but it is also not an object of scorn, considering the superior unibody metallic frame Samsung A3 is claimed as the thinnest smartphone company has ever made. Samsung’s Galaxy A3 bears a 5.0 inch display and is powered by a 1.2 GHz powerful Quad-Core processor along with 2GB of RAM. Samsung Galaxy’s A3 is equipped with a 13.0 megapixel camera that’ll put all the bulky competitors to the rest for good. Samsung Galaxy A3’s will come to Asia most probably in November and then it’ll be launched in rest of the world. Samsung Galaxy family’s A3 have not yet told us about the price but it’ll definitely be lower than Alpha or any other premium model of the company. Samsung Galaxy A3 will give you a stunning display at any viewpoint as it’s equipped with sharp screen to excite the your feelings. Galaxy A3 by Samsung allows you to capture vivid videos at a resolution you would have never felt before. Here to touch your sensibilities, Samsungs latest Galaxy Handset A3 is device to experience.